A popular quote by Bill Mollison, one of the originators of the concept of Permaculture, talks about making the switch from consumption to production. This is of course viewed from a “developed world” point of view, in the developing world most people already produce more than they consume (although it’s gradually changing here as well), 70% of the world’s food is produced on farms smaller than 5 acres, often by women. Even in the West, the switch from production to consumption is a relatively recent event, at least for the majority of people. To be clear, we are not preppers or survivalists, but we believe that we should leave behind a better place than we found and also that most food available in supermarkets and shops is not safe for consumption. In tropical climates the switch (back) towards self reliance can be effected more easily, provided water is available the growing season can be almost 12 months long and the limiting factor tends to be too much heat rather than not enough sun. In January of last year we had our first meal made entirely of home grown veggies, it felt like a milestone then and I was very proud, nowadays it happens often, especially in the winter season. Another milestone we passed this winter is a financial one, for the first time since we started the income we are generating from selling produce from the farm plus that from guests, residents and interns is enough to pay all of our costs and make a small nominal profit, I will write more on this in a separate post. RICE. The first step we took was building our house using natural building techniques, in that same rainy season we planted rice, which we have continued to do every August, last year we used a smaller plot and we got more than enough for us and all the animals, approx 450kg. We are getting better at it, especially in terms of reducing the labour required, every year we make less mistakes. I made a rough calculation and I think we managed to produce a good quality organic Jasmine rice for less than what it would cost us to buy a standard rice from a wholesale merchant. So that’s a start. PERENNIAL EDIBLE GREENS. These are just some of the perennial greens in the garden this morning, the morning glory in the photo is not strictly speaking perennial, but it’s very easy to grow in all weathers and there is a perennial variety that leaves in or near water. I could probably go out and take another ten photos of edible greens that we often eat, but this is enough for the point I am trying to make and most of the other plants don’t really have english names anyway. We also have a lot of cassava planted around the edge of the site, which we go and dig up anytime we feel like a potato type starchy thing. ONION, GARLIC, PEANUT AND PUMPKIN are very easy vegetables to grow, they can be stored for a relatively long time and, especially with onions and peanuts, they are harvested in one go, dried briefly and put away for later use without need for further processing. During the last few months we have also been growing okra, eggplant, cucumber, tomato, sweet potato, carrot and various salads as well as the usual Thai veggies like winged bean, yard long bean, mustard greens, amaranth etc. These have a shorter growing season and we are learning to grow them together in mixed beds, interspersed with chilli, marigold, lemongrass and various Thai herbs that help to keep the insects away. BEANS. We have started growing beans to dry and store, this winter we planted eight beds of red lima beans and cranberry beans, thank to seeds from the good people at ECHO Asia. The lima beans are definitely more suited to the climate and grew well, the cranberry less so, but they are really delicious and we intend to persevere and increase production. In total so far we have harvested around 20kg of dried beans and there is still a bit more to come, 500g of beans per week for the whole year should be a good starting point. Everything is grown without using chemical fertilizers or pesticides, we make our own compost with cow manure purchased from local farms and biomass from our garden and from neighbours, various fertilizing microbial juices and teas, including liquid calcium and liquid phosphorus and our own natural pest repellent from herbs grown on the land. We are slowly closing the loop, we would be ideally set up for rearing half a dozen pigs and that would mean we would produce almost all the required manure, but we do not feel up to killing animals and have instead opted for a vegetarian lifestyle. 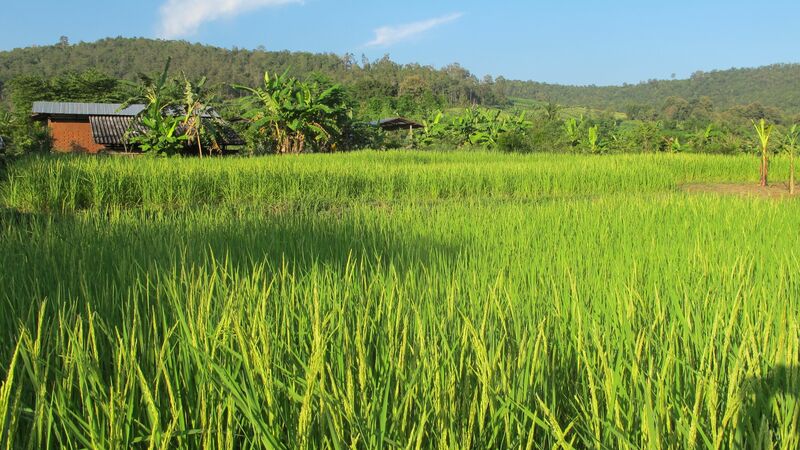 Categories: mae mut agriculture, natural building, random stuff | Tags: adobe, chiang mai, farm stay, food forest, growing food in the tropics, natural building, nitrogen fixing, northern thailand, organic farming, self reliance, tropical agriculture | Permalink. Hi Martin, hope all is well with you. We feel very rewarded by our slow progress towards easy and simple living and find that our overall health both physical and mental benefits from it. Such wonderful bounty! Beautiful work over there. You should be proud. I am a new reader. Great Blog. I back yard garden in Republic of Panama. I am making my share of mistakes. I am having good luck with sweet potato’s which I didn’t notice you mentioning. I also grow okra. Are you growing a local variety of okra? I had to order some okra seed since this veggy is not eaten in Panama. Having some problems with it. It just grows real fast, produces a few pods, then peters out. I am pruning it now with hopes of some branches forming and new pods. But, since I have okra that is not native to Panama, the problems to come are just not known at this stage. Great blog by the way. Love your Little farm. I am only growing a small back yard garden and it really keeps me busy. Lots to learn and never enough time. And, its super hot where I live. Hard to work in the middle of the day, thats for sure. Thank you for following the blog. Okra is useful as it grows well almost anywhere, what I sometimes do is dry the first couple of pods of a new batch and replant immediately, so that I have new plants ready when the old ones stop, they never last long, but you should be able to get around 20+ pods per plant, in our experience it grows more or less in every season.